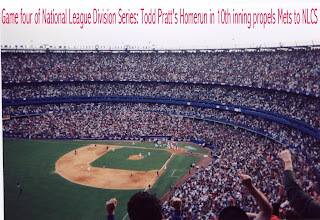 1999 NLDS Mets hero Todd Pratt will attend Spring Training with the Yankees as a non-roster invitee. Once there, he'll compete with five other catchers for the right to back up Jorge Posada. Also yesterday, transplanted ex-Met outfielder Richard Hidalgo agreed to a minor league contract with the Houston Astros. Hidalgo has not appeared in a major league game since 2005. The Mets donated $25,000 to Esperanza International to assist 500 families interested in starting a business during a ceremony at their training facility in Santo Domingo, Dominican Republic. $25,000 to help 500 families start businesses? Unless I am totally reading this wrong or completely forgot how to do simple division, that works out to $50 bucks a family! $50 bucks will start you a business in the Dominican? I know that the DR is kind of an impoverished country, but that is really surprising. If anyone out there wants to cure me of some ignorance, and educate me a bit on this, please post a note in the comments section. The Mets are about to sign Jorge Sosa, the righthanded pitcher who posted a 3-11 record with a 5.42 ERA for the Braves and Cardinals last season. And you thought Schoeneweis was a strange signing? 13 of his 45 appearances in 2006 were as a starter, all for the Braves, and he went 1-8 with a 5.53 ERA in that role. So clearly Omar isn't signing him to fill out the Mets rotation, we hope. As a reliever Sosa was slightly better, allowing 49 hits (including 13 HR's) and 20 walks against 30 strikeouts in 48 innings, posting a 5.25 ERA in that role. Sosa pitched for the Devil Rays from 2002 to 2004, but had his best year in 2005 with Atlanta, when he went 13-3 with a 2.55 ERA and kept opposing hitters to a .240 batting average. So, he is just one year removed from that breakout year, but it was a truly precipitous drop in performance indeed in 2006. If I had to name one positive thing to say about Jorge Sosa, it would be that for the past three seasons, he's kept righthanded hitters to a .249 batting average. Matt Cerrone is a little higher on this signing that I am. The Mets outbid the Washington Nationals for Sosa's services, who instead signed pitchers Jerome Williams and ex-Yankee Brandon Claussen. The Expos will now no longer pursue Steve Trachsel, according to the article on MLB.com. Washington had extended contract offers to Sosa, Williams, Trachsel, Tony Armas Jr. and Ramon Ortiz, and now that they've signed Williams and Claussen, they'll explore cheaper options. John, if you don't mind me asking, how the hell does Paul Lo Duca act behind the plate??!? Does he use the word "guestimate" when the word "estimate" would suffice? Does his breath smell like week old yogurt that's been in the sun? Because wanting to win is so important to you John. And I'm trying to understand why a human being who went 2-6 with a 4.31 ERA when he had his chance to win in New York to bring the Mets back into the pennant race insinuate that another human being doesn't want to win. Did you want to win? Did you want to win when you gave up 39 runs in 54 innings? How exactly did you act while on the mound? You acted like a country bumpkin afraid to pitch in the big city. That's how you acted. It's certainly how you pitched. It's how you pitched on August 3rd, 2002 in your Mets debut when your error allowed four runs to score before giving up a home run to Jay Bell...Jay Bell! I'm beginning to think that the only time you're not scared is when it comes to ripping guys that you've never played with from miles away when you know they're not coming up on the interleague schedule in 2007. Now you're brave, eh? Maybe if you would have translated some of your bravery to the pitching mound when you were a Met...where your two victories came in games where you got 21 runs of support combined. Maybe you could have used some of that bravery when you were deciding where to pitch in 2003 when you couldn't wait to bolt New York to go pitch in mega-metropoli such as Arlington and Atlanta, where catchers didn't act like Paul Lo Duca and your left fielder was Shane Spencer. Hilarious. Do yourself a favor and read the whole post. By the way an earlier post from Metstradamus (on Bobby Bonilla) was good enough to get quoted in the NY Daily News this morning. He followed it up with another gem! According to the St. Louis Post Dispatch, Braden Looper may emerge as an interim starter for the Cardinals until Mark Mulder's healthy, and that his willingness to fill the fifth starter role is part of the reason the Cards have been in no rush to re-sign Jeff Weaver. In November, the Mets allowed the Baltimore Orioles to out bid them for 32 year old right-handed Chad Bradford's services, refusing to match Baltimore's three-year, $10.5 million offer. Today, the Mets reached a preliminary agreement with 33 year old left-handed reliever Scott Schoeneweis on a $10.8 million, three-year contract. OK, to be fair I'll give you one thing that Showinwise has over Chad Bradford. For the past three seasons, left handed hitters have a .402 on base percentage against Chad Bradford. Scotty Boy has kept lefties to .295 OBP. For that reason (presumably), his wallet is also now $300,000 heavier. According to their website, the Expos have made a contract offer to Steve Trachsel. They've also offered deals to Tony Armas Jr., Ramon Ortiz, Jorge Sosa and Jerome Williams. According to the article, the offers range from Minor League contracts to $3 million. If Trachsel signs with Washington, he'll play for new manager Manny Acta. By way of MetsBlog, You have to read Transplanted ex-Met John Thomson's quotes for why he signed with the Blue Jays instead of the Mets. "As far as just looking at Paul Lo Duca across the field, I'm not really into how he acts behind the plate," Thomson said on a conference call. "I know a bit about [Toronto catcher] Gregg Zaun and I know he wants to win and he's not going to let anything get in his way to do that, and I like that. "And then with Vernon Wells in center field, I'm not really concerned about the outfield with him out there. ... Just watching the Mets' outfield, if Cliff Floyd is still there it's not a real good fit for him out there. He can hit the ball, but as far as defense, he's a little shaky. "I just liked what's happening in Toronto." Okay, John, it wasn't enough that you stunk for the Mets and pitched well for the Braves, you have to go and rip Paulie and Cliffy? Way to wait until you switch leagues to bash them, you weasel. And exactly what is happening in Toronto that you like so much? Finishing ten games behind the Yankees and watching the Red Sox try to outspend the GNP of Canada? Jackass. Yes, John Thomson is a transplanted ex-Met. You may remember he was acquired mid-season in 2002 from the Colorado Rockies for Jay Payton and Mark Corey (remember him?) during the Mets ill-fated wild card chase. He made nine starts and went 2-6 with a 4.31 ERA for the Mets. He then landed in Texas for 2003 and lost 14 games for the second straight year. We all thought he was washed up and laughed when the Braves signed him later that winter. He went on to have the best season of his career with Atlanta, going 14-8 with an ERA under 4. In 2005 and 2006 however, he reverted to form and went 6-13. ANYWAY, transplanted ex-Met John Thomson signed a one year deal with the Toronto Blue Jays yesterday worth $500,000. Adam Rubin brings us news that 1986 Met Tim Tuefel has rejoined the Mets organization, managing the A-ball Savannah Sand Gnats. I was real excited when I read this because the Sand Gnats play in the same league as the Greensboro Grasshoppers, but after checking the 2007 season schedule, it seems that the 'Hoppers won't be hosting the Sand Gnats this season; only playing them in a road series. I keep missing chances to Meet the Mets! Before I moved here Mookie Wilson managed the Kingsport Mets, but was promoted up to Brooklyn before I could travel to Tennessee to have him autograph my dog. I know the Mets run that winter caravan in February but that is more a media event than a fan event. Why not have a Mets Fan Fest at the Javits Center the last weekend of January? Right before pitchers and catchers get ready for St. Lonesome? You get a few players and a bunch of old timers to sign autographs. Sell some Mets memorabilia and apparel. Set up a Q & A with players and announcers. Set up a wrestling ring so I can take on the whole front office of SNY in handicap match or better yet a lumberjack match where the no name talking heads of SNY and my fellow Mets bloggers would surround the ring and push the combatants back in the ring. Now that’s entertainment! Seriously, why doesn’t Mets management put a Mets Fan Fest together it seems like a no brainer to me. Great idea Steve. This would be another excuse for me to make an annual trip up to New York. If anyone out there happens to run into the Wilpons please pass the idea along. Cal Ripken, Jr. (537 votes) and Tony Gwynn (532 votes) narrowly beat out ex-Mets Orel Hershiser (24 votes), Bret Saberhagen (7 votes), Tony Fernandez (4 votes), and Bobby Bonilla (2 votes) for election into Baseball's Hall Of Fame. None of the eligible ex-Mets received enough votes to stay on the ballot, so in 2008 there will be no Mets on the Hall Of Fame ballot! we will look to 1999 Met Shawon Dunston to represent the Metropolitans in the vote. After that, We will have to wait until 2009 it will be Rickey Henderson (he is retired, right?) in 2009, and then Robin Ventura appears on the ballot in 2010. You thought Doug Mientkiewicz was difficult to spell? Buster Olney says the Mets are set to sign free agent relief pitcher Scott Schoeneweis to a three-year deal. I can't wait to hear Omar Minaya hype this signing, as it was just last week when he said the rest of the available free agents were of the bottom feeder ilk. 32 year old lefty Schoeneweis had 29 K's in 71 appearances last season for the Reds and Blue Jays, and though he has been used mostly as a reliever the past few years, he did make 19 starts for the White Sox in 2004. He is "a sinker-slider pitcher who's significantly more effective against lefties," according to Baseball America's Jim Callis. His 16 games for the Reds down the stretch last season were his first in the National League, and he had 11K's in 14 innings, converting 3 saves and posting a 0.63 ERA. For his career, he's allowed one out of every 3.6 inherited runners to score. What Is Your All-Time Least Favorite Mets Team? Man, the names on my list evoke some baaad memories. What are your nominees? Maybe the Mets can build a promotion around this idea, like when they named the all time greatest Mets at each position a couple years back. I was successful in landing tickets to Opening Day (and six other games) this morning, when I bought the Mets Opener Pack, a group of seven games pre-selected by the Mets. As soon as I got the confirmation from Mets.com, I put in my request to HR to take Monday, April 9th as a "Floating Holiday." Not a vacation day, not a personal day. Opening Day is a bigger holiday than Thanksgiving for me. And lucky for us Opening Day falls the Monday after Good Friday this year, so I'll be able to make it a four day trip up to New York to see the Mets play the Phillies in Shea Stadium's penultimate home opener. As for the other six games I bought tickets to? Doesn't look promising. But I am slotting Labor day weekend for a trip down to Turner Field. Opening Day 2007! Hope to see you there! Duaner Sanchez was a linchpin of the Mets stellar bullpen last season, and even though his season was cut short by a taxi accident, the Mets feel confident enough in his ability to double his salary for 2007. He'll bring home 850 big ones next season, more than enough to pay restaurants to deliver late night snacks to his hotel room. Acquiring Sanchez was a very successful move by Omar Minaya last offseason. He was acquired from the Dodgers for Jae Seo, who was then shipped to the Florida Rays in June for Mark Hendrickson. Roger Cedeno is back in baseball, agreeing to a minor-league contract with the Baltimore ex-Mets. If he makes the club, he'll earn a half-million dollars and get the privilege of sharing a locker room with Bruce Chen, Chad Bradford, Kris Benson, Melvin Mora and Jay Payton. Miguel Cairo re-signed with the Yankees this weekend. He will either be the Yankees utility infielder, or else he'll serve as the righthanded platoon at first base to fellow 2005-era Met Doug Mientkiewicz. By the way, I am about to switch over to Google's "new" blogger utility. Hopefully this site won't crash or delete all my old posts or anything like that. They tell me the transition will be seamless, but I'll believe it when I see it. Hopefully there will be a benefit to the change, of which Google has been selling hard. Wish me luck! Still no word yet when single-game tickets for the 2007 go on sale, but on Friday, January 12th, the Mets will offer for sale, "seven packs," groups of seven pre=selected games. There are seven sets to choose from, including the "Rival Pack," (with games against the NL East as well as the Yankees Giants and Cardinals), the "Champion Pack," (with games against all the 2006 division winners), and the "Jose Jose Jose Pack," with Friday night games including something called Merengue Night and Fiesta Latina*. Last season the Mets offered a six-pack, but due to drawing 3.5 million fans in 2006, they must figure they can squeeze a few extra bucks out of these "packs." This is not unprecedented at all. In the mid-nineties they sold six packs, but by the time they went to the World Series in 200, they started selling eight-packs. Then after a couple lean years, they worked their way back down to a six pack in 2006. So, this does not bug me too much. What is annoying however, is that there is just one seven-pack that features the home opener (the "Opener Pack,") and it does not include a Yankees game. This is a new scheme by the marketing folks over at Shea. Last season, my buddies and I bought the "Pedro Pack" after getting shut out of Opening Day tickets, which got us Opening Day tickets and a Mets vs. Yankees game. We didn't mind shelling out money for six games even though we weren't sure how many we'd be able to go to (especially me, living in Greensboro, and all), but it was well worth it because it was a heck of a lot cheaper than paying a scalper for Opening Day or Mets vs. Yankees tix. In 2007 though, all the seven packs feature a Mets vs. Yankees game, except the Opener Pack. The other six games are all weekday games as well, minimizing the opportunities for me to attend any of the other games. At least a Saturday game I'd have the option of flying up for the weekend. Alas. By the way, if you're like me and bought a six-pack last season, you'll have a three-day exclusive window to buy these sets, starting Tuesday morning, before the general public gets a shot at them. Good luck! Still another thirty-eight some-odd days until Pitchers and LoDucas report. Like Greg at Fear and Faith in Flushing, I distrated myself from teh lack of baseball by watching a bit of football this weekend. I watched the Cowboys lose Saturday night, and since I know Mike Francesca is personal buddies with Parcells, a little schadenfreude made the night go by.